Entries for Nia’s Christmas card competition that were placed in the commended, highly commended and very highly commended categories will join winning designs and runners-up on display from 5th December until Christmas in Llanelly House, Bridge Street (opposite the Parish Church), Llanelli. Llanelly House has recently opened after restoration, and the Christmas card display will be on the ground floor where there is no charge for admittance. The competition was open to local primary schools and attracted several hundred entries. The theme for the design was Christmas tree. The very difficult job of judging the entries was undertaken this year by John Wynne Hopkins, local artist, Rebecca Davies, editor of the Llanelli Star and Nick Thomas, project officer for Pembrey Forest Conservation Trust. They were looking for a design which used the theme of a Christmas tree and would be suitable for use on a card. The winning design is shown on the front of the card, and the runners-up have their designs featured as thumbnails on the back of the card. 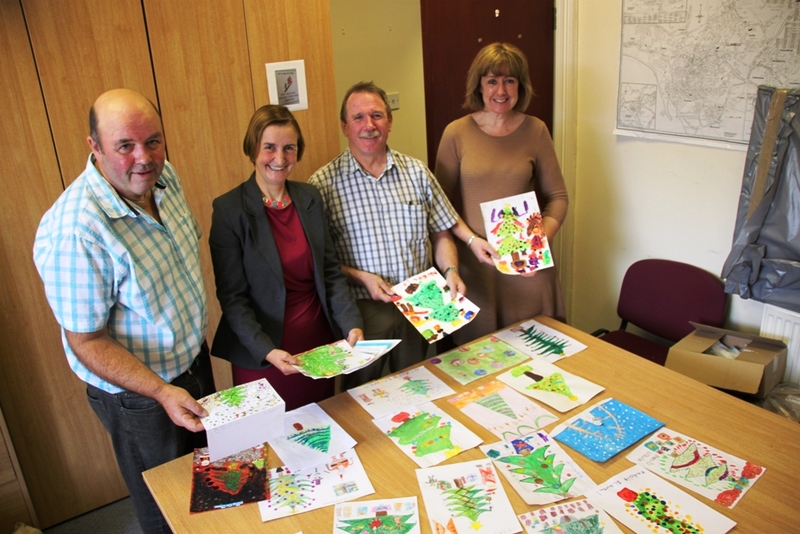 Skye John, age 7. of Dafen School won the Junior category and Cari Jones, age 5, of Ysgol Babanod Llangennech won the Infant category and their designs will be used on the MP’s Christmas Cards.